A Cardboard Problem: How do you judge success? That's the visiting dugout at Citizens Bank Park about an hour and 15 minutes before first pitch. 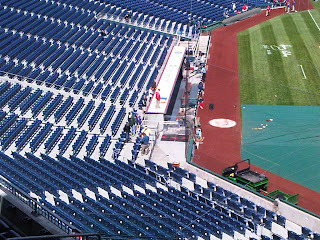 Right behind the dugout there are two children standings there with a bat, ball and a pen. If you squint you might be able to see them. As I sit here and watch the Milwaukee Brewers batting practice (Phillies didn't take BP today), it got me thinking about these two kids who have flagged down every Brewers players for an autograph. Not one has obliged. I'm not even sure any of them have looked their way, but it's hard to tell from this distance. I've never gone to a game early for batting practice and tried to get autographs. I have no patience for pre-game festivities. As a fan, I show about five minutes before first pitch, if I get in before the game starts. It's terrible, but I hate waiting for a game to start. For work, I have no choice but to get here early or else my work doesn't get done. But, my mind tends to wander and now I am thinking about 'Jimmy' and 'Bobby.' (that's what I've named the two boys behind the dugout). For those that go early, how successful have you been at procuring autographs? There is one Philadelphia player signing right now. I believe it's Ryan Madson. He started in the outfield and is now working his way down the line, signing for every one out there. Also, do you need a ticket for those seats to get an auto? If you are in the upper deck, are you allowed to go down during the pre-game to get autos? Is the trip only successful if you get Prince Fielder's auto. Or do you care that you got backup catcher's Mike Rivera's autograph? Do you even ask for Rivera's autograph? I've never done this. I am genuinely curious. Jimmy and Bobby should have gone to the Phillies side of the field. There's no luck on Milwaukee's side. As far as I know you don't have to have tix to those seats to go down there before the game. I went to the Braves/Tigers exhibition game in Atlanta, and I went down to the field level even though my seats were in the upper level, but it could be different because it was an exhibition game and nobody really cared if I was there or not. I also think the success level would depend on the motive for obtaining the auto. If you are looking to score some dough on ebay then you probably aren't successful by getting Rivera to sign you ball, but if you're a true fan and just want the autograph for a relic to remember the game by, then I would consider that a success. I wondering if a lot of the big name guys can't sign because of some sort of endorsement or signing contract. I know some collectors have run into this doing TTMs through the mail. I go to a lot of Phillies games. You don't really need a ticket to go down to the field for bp, but some individual staffers might call you on it. Jamie Moyer signs just about every day for 15 minutes or more, unless he is pitching. Chase Utley comes over and signs a few from time to time. Other players will sign intermittently . I am one who loves the pregame. It has changed much over the years. As an adult and a kid I have gotten shooed from the box seats before many a game for not having the right kind of ticket. I have never really tried for autographs, but do like to see and hear the players up close. My fondest memory, from decades ago, was seeing Ron Santo take a throw at third base from the outfield between his legs with the glove behind him, then pivot and throw to first. They used to put on a show before the games. I used to do this all the time as a kid in Philly. I always went to to the visitor's side because there was less of a crowd. This is how I got such autographs like Pat Rapp and Turk Wendell. Another perk is that ballplayers might give baseballs away to kids when they're down there. My brother got one this way. It seems you will generally have better luck with pitchers signing than position players. I can't speak for Philly but last year I took my fiancee to Yankee Stadium for her birthday and got really good seats 3 rows behind the camera well to the right of the Yankee dugout. She is a photographer for the Scranton Yanks so I thought I'd give her the best shot to take awesome shots of Yankees players. Well, just before game time, Johnny Damon started signing right in front. I had brought a baseball, gave it to her and told her to get Johnny if she wanted. She ran down, got his autograph and had a blast. Certain ballplayers just have that thing about them. Johnny Damon will always hold a special place in her heart for that, and I will always hold him in high regard. That one exchange is what makes going to pre-game festivities worth it. I know I will never forget my first baseball autograph, it was Mackey Sasser behind home plate at Yankee Stadium in 1993. I'll never forget him signing the back of my Yankee program. Boredom lasts up to an hour. A good baseball memory gets passed on forever. Further reason to enjoy Triple A games. When I was younger at Yankee games the seats down by the field were actually affordable, so we usually sat there. Standing by the Yankees on deck circle, and leaning over the wall with a friend holding my feet and scooped up a ball that escaped from Tim Salmon. The ball is in a plastic bag with my ticket stub. Another occasion with the same friend, we were in the same spot on cap day, and Bernie Williams came over and said hello to all the kids hanging out and signed anything we had. I only had my cap so he signed that, and my brother got a ball signed. Today, I would be "lucky" if the Yankees were kind enough to even let me see the game much less get close enough for an autograph. I haven't tried in other places, but I have heard that Baltimore is very easy to get sigs from Yankees. From what I've seen, you can hunt for autos as long as the owner of the seat your standing in doesn't show up. Personally, a success is any sig no matter who. It could be former Sox 3rd base coach Wendell Kim who was always standing on the dugout signing, or former Mariner Alex Rodriguez who signed for me during a Fenway rain delay. I just want something to remember the game. Of the 200 or so Yankees games I have been to, I didn't sit in the bleachers maybe six times. In the old Yankee Stadium, the bleachers were cut off from the rest of the stadium making it nearly impossible to try and get an autograph or something. Perhaps that is why I didn't care to get there early.